Larger than life grown men in nappies fighting each other inside a ring? Sounds more like a drunken night out rather than a sport. Actually it couldn't be further from the truth. 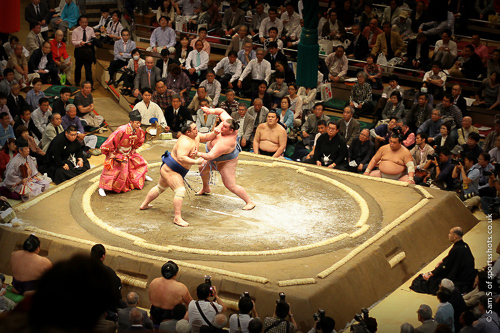 I got to peek inside the world of sumo wrestling and see for myself that this ancient activity truly deserves to be called a magnificent sporting event. 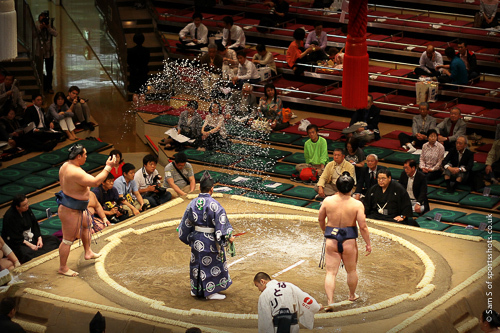 For those unfamiliar with the official ritual of the sumo, each fight begins with salt. 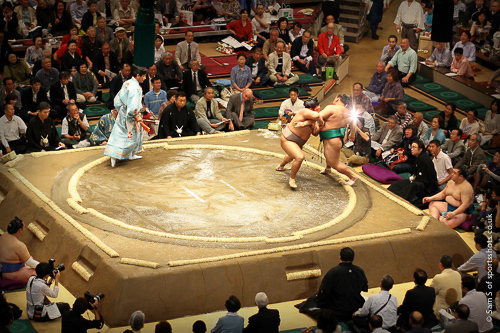 Each wrestler throws salt into the battle ring simply to purify it, giving fresh ground to fight upon. Next is the psyche out. This is done to intimidate the other opponent and is a chance before the contact to read each other, show off their incredible size and ultimately their strength. The intense staring can take minutes and sometimes has the crowd up in arms. The wrestlers loom in front of one another creating mass amounts of tension, and then, everything thereafter happens in slow motion. Imagine two incredible forces colliding with each other, their faces smashing into their opponents thick shoulders. You hear the first slam of flesh. 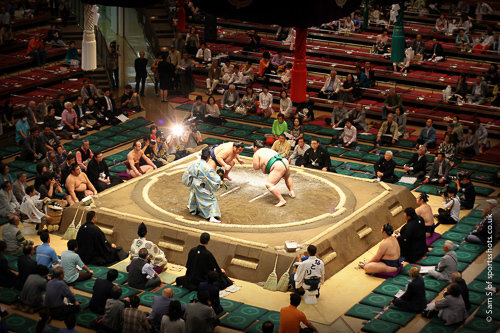 They use their incredible arms to push away their initial contact and so the fighting begins, pushing and driving the other out of the ring, pulling and tugging on the "mawashi" - the belt, to make them lose balance. Fights last for seconds and they're as intense as can be. The photographs don't even come close to describing the awesome power these wrestlers have, you have to see it to believe the absolute strength and talent these men possess. Japan is a mainly conservative country where most women stay at home and the men bring back the rice, but in the world of sumo, it's about the very foundations of human nature; strength, instinct and respect. 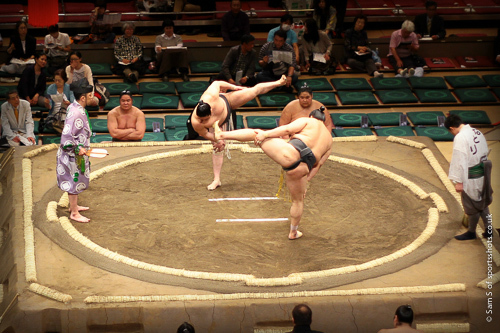 It takes years to develop an adequate form suitable for performing such a full contact sport, in fact, most westerners hardly understand the voluntary weight gain, in actual fact, sumo wrestlers eat nothing but healthy food, their usual dish called "chankonabe" isn't far off what we'd call a vegetable stew, they just eat a lot of it is all. 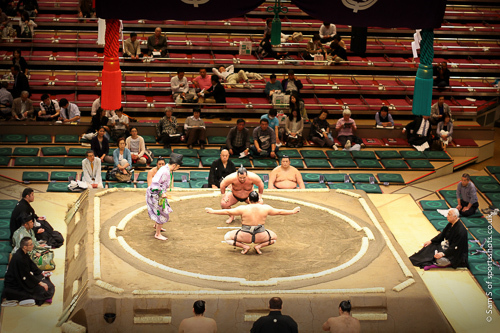 I attended the Tokyo tournaments during it's second day, so the Grand Sumo Hall was quiet enough for me to hear the slaps of the sumo's feet against the ground, even from 100 ft away. Sumo wrestlers are idolised by the Japanese, but they remain as gentle as can be, often being spotted on the subway just as a regular Joe Takahashi. 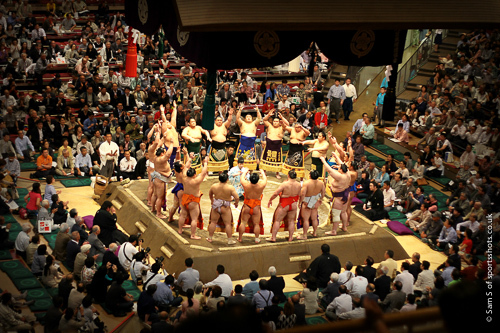 Every single sumo wrestler was as humble as pie, even continuing that state way into the fight and even after the match was over, bowing to the winning opponent, bowing after leaving the ring and even bowing to the audience. Their absolute respect for other wrestlers and the sport itself is what mesmerised me the most and made 4 straight hours of wrestling watching feel like 20 minutes. 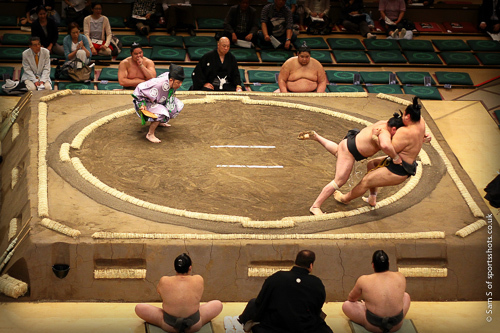 Sumo is not just a word, sumo represents years of tradition, sound practice and unfathomable strength and talent. Even though the sport is losing popularity in the new age of Japan, mainly against other sports such as baseball, I would pay good money to see those battles again, it was the most interesting sporting event I have ever been to.